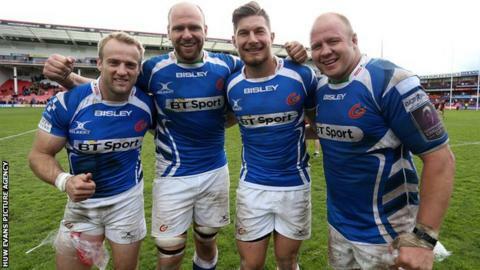 Newport Gwent Dragons captain Lewis Evans says their 23-21 win at Gloucester to reach the semi-finals of the European Challenge Cup is among his career highlights. Charlie Davies' late try ended the holders' 15-game unbeaten European run. "We've enjoyed derby wins over the years but winning away in Kingsholm in a quarter-final is certainly right up there," Evans said. "Today was something fantastic for the team, but the fans deserved it." Replacement scrum half Davies crossed after acting captain Evans decided to kick for the corner and a possible winning try, rather than tie the scores with four minutes left. "To get over that (winning) barrier is great for us, personally to be the one to touch down it's elation. I'm really happy for myself but more importantly for the team to move on in this competition," said the Welsh-qualified scrum-half. "I've only done that (reached a European semi-final) once before with Wasps, that was against Gloucester a few years ago." Evans, who has been at the Dragons for a decade, was left to enjoy the fruits of his gamble. "Towards the end the momentum was in our favour, we had our tail-feathers up and we thought we'd keep the building the pressure," he told BBC Wales Sport. "It wasn't just me making the decision, as soon as I said it, everyone backed it." Wales number eight Taulupe Faletau also ranked the game as an all-time highlight. "It's an amazing feeling, we can take confidence from this" said man-of-the-match Faletau, who is leaving for Bath in the summer. "The boys put a heck of a shift in and were rewarded with the result. "It's up there for the top game I've been involved with for the Dragons. It's always nice to be in (contention in) a competition, it gives the boys something to play for." It is the second successive season that the Dragons have reached the last four of the second-tier European competition. In 2015 they beat Cardiff Blues in a home quarter-final only to lose heavily at Edinburgh. Dragons' semi-final opponents Montpellier are second in the French Top 14, but the Welsh side can take heart from wins at Pau in the current campaign and Stade Francais in the 2014-15 season. "The stadium looks fantastic on TV and I've always wanted to go there for an occasion," Evans said. "This is one of the best ones for a semi-final, so let's go out there with the same mentality to play and to win."